The Leader-Herald/James A. Ellis Fonda-Fultonville's Brittany Castelluccio and Mechanicville's Jada Brown break from the line during the finals of the 100-meter dash at the Section II Group 4 championships Thursday at Fonda-Fultonville High School. 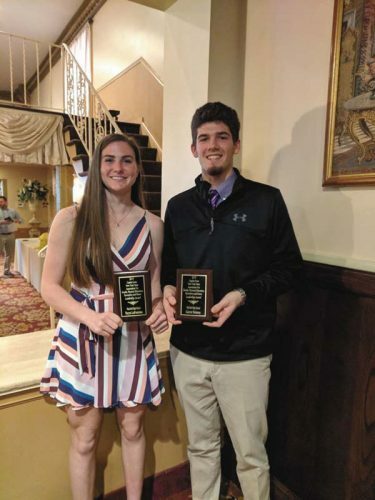 FONDA — Brittany Castelluccio and Emma Rhodes recorded two wins apiece as Fonda-Fultonville finished second to Greenwich in the girls’ team standings, 95-76.5, at the Section II Group 4 track and field championship Thursday at Fonda-Fultonville High School. 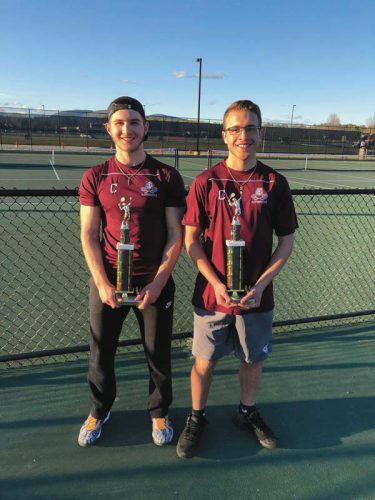 Canajoharie placed fourth in the standings with 54 points and Mayfield-Northville was seventh with 39. Castelluccio won the triple jump with a leap of 35-04 and the long jump with 17-05.5. She added third place finishes in the 100- and 200-meter dashes with times of 13.46 and 27.61 respectively. Rhodes topped the field in the 100-meter hurdles with a time of 16.58 and the 400-meter intermediate hurdles with a time of 69.81. She added a third place finish in the long jump with a leap of 15-08.75. Emilia Vardi-Davidson was second to Castelluccio in the triple jump with a leap of 32-00.5 and Alyson Shirley tied for sixth in the high jump, clearing the bar at 4-06. 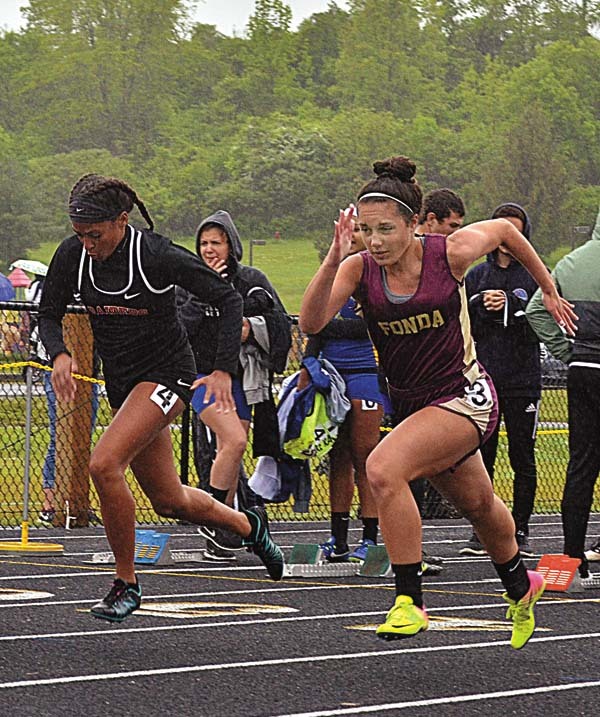 Jordan Porter led the Canajoharie girls with her victory in the 400-meter dash with a time of 62.98 and a second-place finish in the 800-meter run with a time of 2:31.13. Emily Mayer was second in the 400-meter intermediate hurdles with a time of 1:11.56 and placed fifth in the 100-meter hurdles in 17.62. Alexz Lather placed third in the pentathlon with 1,973 points, while Abby Smith was third in the pole vault with a height of 8-00 and Meghan Dingman placed fifth in the 400-meter dash in 65.06. Madison Relyea placed second in the 1,500-meter run with a time of 5:02.05 for Mayfield-Northville and had a third-place finish in the 3,000 with her time of 11:09.07. Hannah Coupas was second in the 400-meter dash with her time of 63.38 and tied for third in the high jump, clearing the bar at 4-06. Mikayla Myers finished fourth in the long jump with a jump of 15-02.75 and was fifth in the triple jump with a leap of 30-08.25. Emily Frasier finished sixth in the pentathlon with1,650 points and Sam Kent threw the discus 83-05 for a sixth-place finish.